Mass Effect is an interesting series. I dove into the first game in 2007, going as far as to back-to-back my Paragon and Renegade playthroughs and jumping into those two early books by Drew Karpyshyn (once the second arrived in 2008). The first book (Revelation) added to the impressive world-building that the series started with. Small touches like using accelerated metal slivers to provide effectively infinite ammo with overheating as the only concern really added texture to the world, a mix of Babylon 5 and Star Trek from the studio who previously had the Old Republic license from Star Wars to build their binary morality play around. Even the music, inspired by late '70s SciFi, gave a very clear direction to the action. It also fell short in many way, from endless duplicated assets for the side missions to clunky real-time combat and a terrible inventory system on top of a very basic upgrade curve. It was a game to love despite the faults. The story arc was broad but every mission provided masses of detail and an encyclopedia of additional notes. I read every entry, treasured every encounter, and saved the galaxy from a threat that was only the first prong of something much larger. I was very much ready for more from the series. Then the second game happened. The larger story was put on hold as the series turned into a purely character-focused affair while the mechanics were made significantly better, allowing combat to become enjoyable without being part of something larger. The logical conclusion of this progression was Mass Effect 3 and the multiplayer combat mode which works entirely on loot crates and the intrinsic reward of how combat feels. But something more than the larger progression was lost as the series moved forward, that world building fell away. Those lore notes about how ammo wasn't a thing, only heat management? ME2 added thermal clips which, effectively, shunted ammo back into the series with a wave of the hand about how throwing away hot metal blocks allowed faster firing (blocks which never cooled down and had to be replenished from fallen enemies). There's a lot to write about how the series possibly peaked in Mass Effect 2 but never managed to eclipse the charm and world presented in that first game. Luckily someone else has already written that book and I agree with enough of it to make doing a full dive superfluous. But I recently went back to ME2 and wanted to share some of what I found there and what I got through playing the series on a modest PC. The first thing you'll notice, especially if you previously played on console, is that the PC port has absolutely no controller support. This is despite being developed for the same release as the 360 version and containing most of the assets and scripting for controller support. Luckily, modders have been bashing their heads against that problem in the intervening years and have now finished fixing that, all the way to changing the accuracy/recoil values back to their 360 equivalents. A full fix that exploits all the code for the controller UI that was left in the game but never officially accessible. Another fix that is possible thanks to mods but this time makes sure the game works far more cleanly than the 360 (native or via XB1) or Bioware ever planned is to remove the large load videos. The way ME2 works, the loading screens have to finish playing at least one loop of the video before they can complete. Most of the loading screen videos have no information and are fifteen seconds long. On a modern PC with an SSD, the game loads in a fraction of a second. This is pointless and can be fixed by replacing the video files with much shorter ones. Even with a low to medium end card such as the GTX 760, Mass Effect 2 is old enough to really be able to push the sliders up to 11. A native 1080p is obviously possible but so is the sparse-grid anti-aliasing that can deal with anything in the scene, thanks to a bit of driver hackery that now allows some Unreal Engine games on DX9 to enable MSAA, something that was broken at launch. There is an outstanding issue with some Z-fighting caused by this fork of UE3 being designed for Windows Vista x64 (no, really) but it's not a constant problem. Outside of that, it's a very nice look for a game that has aged reasonably well outside of the cinematic animations. This was when Bioware started to move further into their experimentation with a cinematic cut-scene camera. Still early days and you can see a few points where the scripting completely breaks but it's more than just a fixed camera and some talking heads. One of the things I'd not remembered from my original playthrough was how backwards some of the dialogue feels. This is Bioware, of smooching and progressive causes fame. Some of the choices here certainly feel out of place. And that scene isn't made any easier by the choice to use DLC outfits, so the NPC is trying to make a barb that doesn't even work due to the character not wearing what the dialogue expects. Speaking of DLC, this game is rotten with it. Expensive DLC that never got the price cuts that the base game got. In 2011, when I first played ME2 on console, I didn't have any premium DLC (that I have to make that differentiation is thanks to EA's plans at the time to give you a "project $10" DLC pack with new copies to limit used sales being valuable - I did buy a new copy so I did have the Cerberus Network DLC). I got Zaeed, Firewalker, & the Normandy crash site but not Kasumi, Overlord, or the Shadow Broker. I still don't have Arrival, which is more of a bridge to ME3 yet was incapable of changing the stakes as ME3 was written not assuming anyone had played it. I think this is one side of why I enjoyed myself more this time through the game (beyond savegame editing to remove the resource grind entirely - I'm not doing that twice): the premium DLC is generally pretty good while the Cerberus Network DLC is really not. I don't care about or for Zaeed and never did. That mission seemed like it barely worked for playing Paragon. The Normandy crash site is a non-event they should be ashamed for if they charged for it. I guess Firewalker is meant to be the meaty one (by virtue of location count) but it also feels barren, filled with perfunctory vehicle sections, and lacking much narrative - if that was in an MMO, you'd call it lacking flavour text and that's a bad state to be in with a Bioware RPG. Kasumi isn't that much content (especially as she lacks much additional dialogue for the main game, a single line dispenser on the Normandy rather than a character you go back to after doing the single loyalty mission) but it was pretty great content for that one loyalty mission. I wouldn't pay £5 just for that (see: this is what EA asked for on Steam in 2011 for the entire base game!) but as bundled in the PS3 GotY for £4, I can see this being a quid or two value. Overlord seems like the weak link in the premium pack. Like, it's cool that they wanted to make a Lawnmower Man rip-off to add a horror edge to the mission and talk about tech but it's... not even a particularly good Lawnmower Man rip-off story they're telling. And that costs £5 to buy too. Now, the Shadow Broker: going in I knew this was the award-winning one. This was also £7 to many so as much an an entire $10 indie game costs. It's up there with the quality of much of the base game, almost as if they would have, in days before DLC where you either needed to go full extra campaign with an expansion or put it all in the box, this would have gone in the box. I don't think it's the best companion mission in ME2, but it's top half and at least involves more fanservice than most of the rest of the recurring cast get from ME1. That SRP is really steep for what you're getting here. And I've got no views on Arrival because I'm not paying £5 to play what reviewed as a very long but combat-heavy mission meant to bridge to ME3. I really don't care for ME3. Going back to technical considerations, note how the above clip shows a pet peeve: in-engine captured footage spliced with actual in-engine shots. We all humour people who say they really can't tell 900p from 1080p and some genuinely can't (these people need glasses). Here, in a DLC mission, the captured footage used is pretty clearly taken from the 360 build, so 720p without anti-aliasing. That's a pretty chocking transition from the current real-time rendered PC version of the visuals. Even if you're watching the clip in a window or on a 720p screen, the difference in sub-pixel accuracy in motion is apparent. It's a reminder of how this game looked to most of the people who played it (as it sold best on console) and how the limitations of real-time rendering change over time, even given identical assets and the same engine. 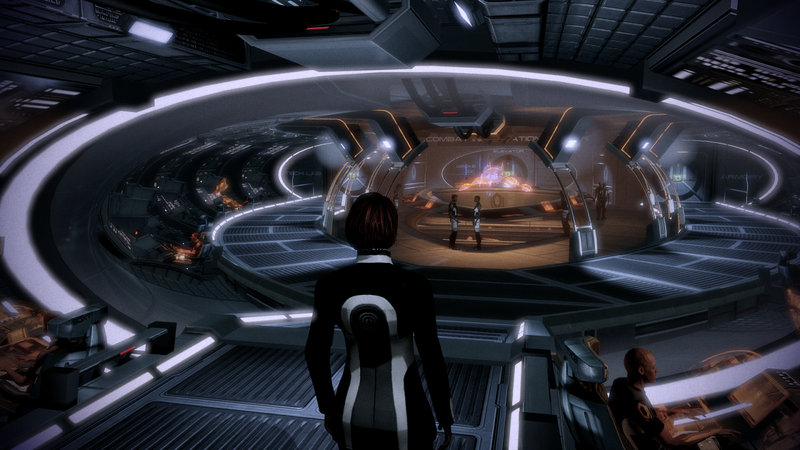 Mass Effect 2 looks quite good today, if you play it in a way that most people couldn't when it was released. There are clear reasons why you add in video clips to avoid loading large level chunks to make cuts with an engine that can't stream in the assets fast enough (for which UE3 was famous) but, personally, I always try and find a different way round this problem (caveat: having never had to work in a large studio, I can make such a choice). Naughty Dog are well known for using this method to completely mask their load times and they also make some of the best 'game asset but tweaked engine' rendered output you'll find - even if it's not good enough for a port, as seen with the PS4 re-releases of their games requiring them to capture out whole new video files to prevent the issue above of a very visible drop in quality from the real-time rendered scenes. Finally, note that in the above clip there is a load screen at the start. The ME2 logo would normally be a 16 second long video of a wireframe ship being spun round. It's good to only have to wait for the actual asset load required on a modern system. I'd almost forgotten how much fun Mass Effect 2 is to play. I still think ME1 is the pinnacle of the series' storytelling and world building - it's hard to beat the original, especially as the series slowly moved away from that late 70s aesthetic and soundtrack - but the sequel did enough with the characters to make up for the ultimately disappointing ending and lack of any real progress in the series' arc.